A well sought-after annual Chinese tradition is the Spring Festival which is the Chinese community’s New Year. This tradition is also celebrated in Malta, where Chinese communities welcome the New Year with their own celebrations. 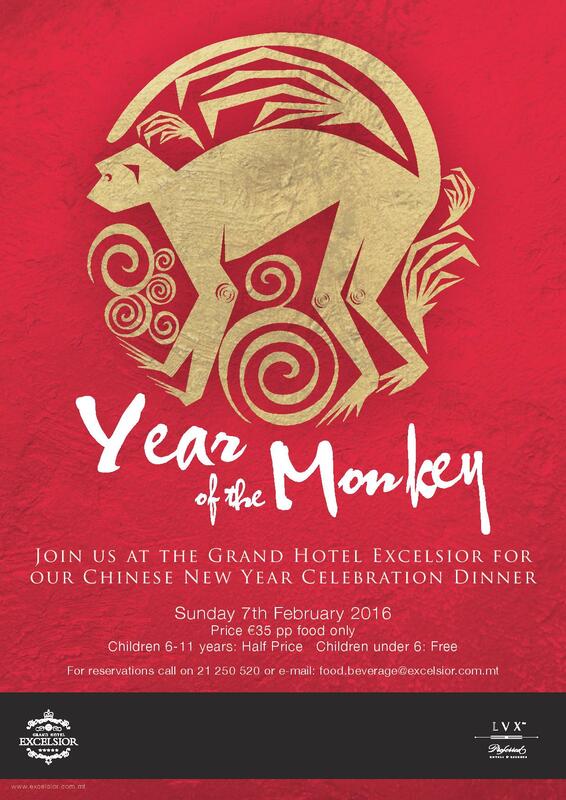 The Grand Hotel Excelsior Malta will be celebrating the Chinese New Year on Sunday 7th February 2016. The New Chinese Year will begin on Monday 8th February 2016. People born in a year of the Monkey are witty, intelligent and have a magnetic personality. Personality traits, like mischievousness, curiosity and cleverness make them very naughty. Monkeys are fast learners and crafty opportunists. 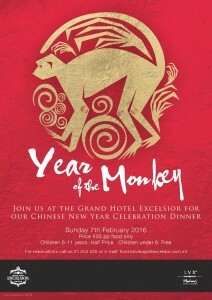 If you would like to experience the Chinese New Year and be part of the celebrations, join us at the Grand Hotel Excelsior for Our Chinese New Year’s Eve Celebration Dinner on Sunday 7th February 2016. Contact Our Food & Beverage Team on food.beverage@excelsior.com.mt or on 21250520 to place your booking. This entry was posted in 5 star hotel malta, About Malta, Dining in Malta, Excelsior Hotel Malta, Holidays in Malta, Luxury Malta Hotel, Malta Events, Malta Restaurants and tagged celebrations, Chinese New Year 2016, Chinese NY 2016, dining, events, spring festival, year of the monkey on January 11, 2016 by Denise Camilleri.